Puntos made their entrance in 1993 amidst a rash of new Fiat and Alfa designs. And the Puntos were an immediate hit over here. But for those who like their motoring a bit more 'on the edge' we had to wait for a Turbo version. That's so radical it deserves a separate page with its rallying brothers! A bit more in the motoring main stream, we at SFC thought their 3 and 5 door range lacked some sparkle. Yes the cars were competent all-rounders and a good replacement for the Uno. But it was at the first major model revision in 1997 that we saw their true potential when the new Sporting appeared. In fact the '97 changes included all the petrol engines and several other significant upgrades. 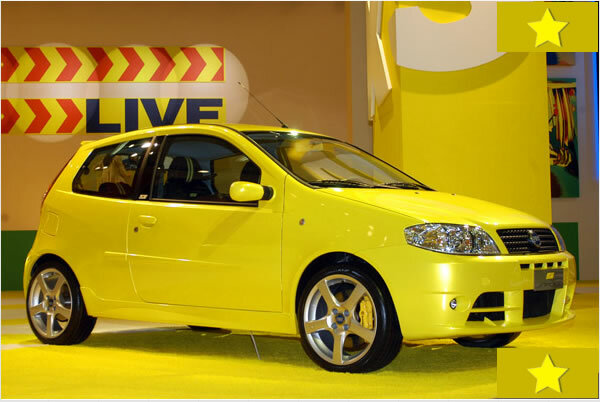 The Punto's unqualified success story began in 1993 with production at a newly automated plant at Melfi near Naples. Fiat formally launched the car in November that year. Like its Uno predecessor, the Punto was styled by Giugiaro - and, like Fiat's more recent trends, the three and five door versions were slightly different. Also, following from the Uno, the Punto was aerodynamically very efficient - with a drag coefficient of 0.31. It was well received in the UK, with positive press comments featuring the Punto layout and spacious interior in particular. The Punto's design was an evolution of the Uno - with a revised rear axle and suspension geometry borrowed from the Tipo solution. Safety features abounded - with similar features to the class leaders - including side impact protection, dual front airbags (optional on base models), fire protection systems like a fuel cut-off valve, anti-submarining seats, seatbelt pretensioners, energy absorbing steering wheel and ABS (optional on base models). One area that was extended from the Mk2 Uno was galvanisation. Over 90% of exterior steelwork and 60% of the steel shell was galvanised. - 1698cc diesels (71bhp turbocharged and 57bhp normally aspirated) engines. A little later on (1995 for the UK), came the automatic 'Selecta', fitted with a continuously variable transmission (CVT), using the 1242cc engine and, launched at the same time, was the Giugiaro designed and Bertone built Punto Cabrio. The Cabrio was available with either the 1242cc or 1581cc engine, and featured an anti-roll bar built into the windscreen pillars. In May 1995, the Punto Sporting was released. This used the 1581cc unit, with lower gearing. A trim and body spec similar to the Punto GT were used, including alloy wheels, badgind, internal trim and suspension changes. The real progress of the Punto into true Sporting stardom came with introduction of the 1242cc 16-valve 86bhp FIRE engine in 1997. This is a remarkable little engine and it replaced the 1581cc engine option in both the Sporting and the Cabriolet. The revised Punto Sporting was head and shoulders above the previous versions in terms of performance and driving pleasure. In both saloon and Cabrio this engine makes these 'Sportings' the pick of the bunch. At this point numerous other changes were made to most Punto models, including power steering, air conditioning, new interior trims and external colours, revised suspension settings, improved soundproofing, new wheels and various detail modications. And it was this level of effort from Fiat that saw the UK sales leap into the Punto's most successful years. In 1998 West European sales of the Punto topped 527,000. Production of the Mark 1 Punto ceased in 1999 when the Mark 2 Punto was launched in Fiat's centinary year. The new Punto was introduced in the summer of 1999. Strictly speaking, this was a mid-production update of the Punto, but it included a radical upgrade of the car's components, with 80% of parts being revised. This involved an all new exterior shape as well as a revised rear suspension (torsion beam). The car also achieved class leading passive safety acknowledgements (and an excellent four stars in the Euro NCAP test). - 1747cc 16-valve with 130bhp. The last unit replaced the Punto GT turbo with a normally aspirated engine derived from the Barchetta and Coupé. The new top performance Punto was called the HGT - in common with the Bravo. This stands for 'High Grand Tourismo' according to our Fiat sources. The Mark 2 Sporting, with its 1.2 16v engine and six-speed manual gearbox is a further driving delight. Finally Fiat had woken up to the market with the Sporting - featuring a stiffer suspension and aggressive body styling - a true flag bearer for the traditional nature of small performance Fiats. If you get a chance drive one and put a smile back on your face! For more serious speed we also had the HGT, and quite soon after the first of the rally Puntos based on it. Styling differences between the three and five door Puntos are easier to spot, the five door having a more aggressive appearance especially viewed from the front. All cars came with new options including electronic power steering (with two levels of assistance selectable by the driver) and headlights which stay on for a predetermined time after the car is locked. The HGT also featured as standard a satellite navigation system, ABS and traction control. Transmissions available included a five speed manual, a six speed manual and a CVT or 'Speedgear' system from the Brava and Stilo. This can be used in the fully automatic mode, or as a sequential shift, with six or seven preset ratios depending on model. The Mark 2 Punto made best-selling car in Europe for some years, and in 2003 number 5,000,000 rolled off the production lines (Mk1 and Mk2 totals combined). In May 2003 a heavily revised Punto was released. Significant changes to the appearance were joined by new engines and content. The whole front end has been subjected to a makeover. This includes the bonnet, lights, bumper, wings and grill. At the rear the bumper changed and some other detail changes made including the adoption of the round Fiat badge and additional reflectors on the three door car. Styling difference between the three and five door versions are replaced. The Punto now reflects the Stilo and Marea marketing strategy, with styling depending on the type of Punto model (and options packs). The sportier versions, the Sound (or Active Sport) Sporting and HGT, all feature a different look with the three and five door versions sharing valences. - 1.3 16-valve MultiJet turbo with 70bhp - a new compact diesel, incorporating all the latest technology such as common-rail, dohc, EGR-cooling, turbocharging etc. Fiat have worked hard to deliver additional electronic and transmission features. A new transmission, Dualogic, is available. This is similar to the old Selespeed unit, being a manual gearbox controlled by hydraulic actuators, to provide a sequential shift with fully-automatic mode. Also dual-zone climate control is introduced to add comfort and ease of use, as well as rain and parking sensors. Additional safety features include Fiat's ESP, MSR and up to six airbags. Novelties include the "hill-holder" which keeps the brakes on for 2 seconds if the car is in first gear and a sensor decides that it is on an incline - designed to aid hill starts.... revised colours, interior trims and various changes including the instrumentation and wheels completed the package.